October 9 2016 - Sgt. Yosef Kirma, 29, was critically wounded in the exchange of fire during the pursuit of the Palestinian terrorist who perpetrated a terror attack near Ammunition Hill in Jerusalem. 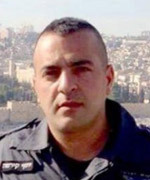 Kirma joined the Israel Police four years ago, and was a member of the elite Special Patrol Unit (Yassam.) Critically wounded during his pursuit of the terrorist, he was evacuated to Jerusalem's Hadassah University Hospital, Mt. Scopus, where he was pronounced dead. Kirma was a resident of the Jerusalem suburb Mevasseret Zion. He was laid to rest on Sunday afternoon (October 9) in the police section of the Mt. Herzl cemetery. He is survived by his wife of five months, parents and two brothers. He was posthumously promoted to the rank of first sergeant. Kirma had been decorated previously after helping to stop a terror attack in December 2015.